Abissinorum Regnu - Hondius (1607). Copper engraved map of the Kingdom of Abyssinia (East Africa) from the first edition of Gerhard Mercator's. Date - 1607 Overall size - 18.9 x 20.2 cm Image size - 17.7 x 19.8 cm. 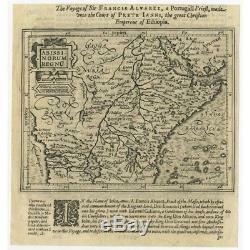 The item "Antique Map of the Kingdom of Abyssinia (Africa) by Hondius (1607)" is in sale since Sunday, January 21, 2018. This item is in the category "Antiques\Maps, Atlases & Globes\Africa Maps". The seller is "bartele-gallery" and is located in Langweer.